I cannot wait to get on that plane to LA! I'm super excited about both races even though I'm still working through my dual pain in the arse injuries. My calf felt better today, I can walk without pain for the first time since the weekend. This is positive. We are almost-sort-of-mostly packed. I usually forget something important. The running stuff is all in the hand luggage just in case. All kitties have been very helpfully packing themselves and adding hair to everything. The weather forecast is gorgeous for the whole trip. LA race day - high 74, low 56. Minimal wind (3 mph). Humidity 71%, UV index 8. SLO race day - am clouds, pm sun/wind (23 mph). High 69, low 47. Chance of rain 20%. Humidity 73%, UV index 8. Both races start just before the sun rises. I want to enjoy every minute, take some pics and appreciate the scenery, the day and the other runners. 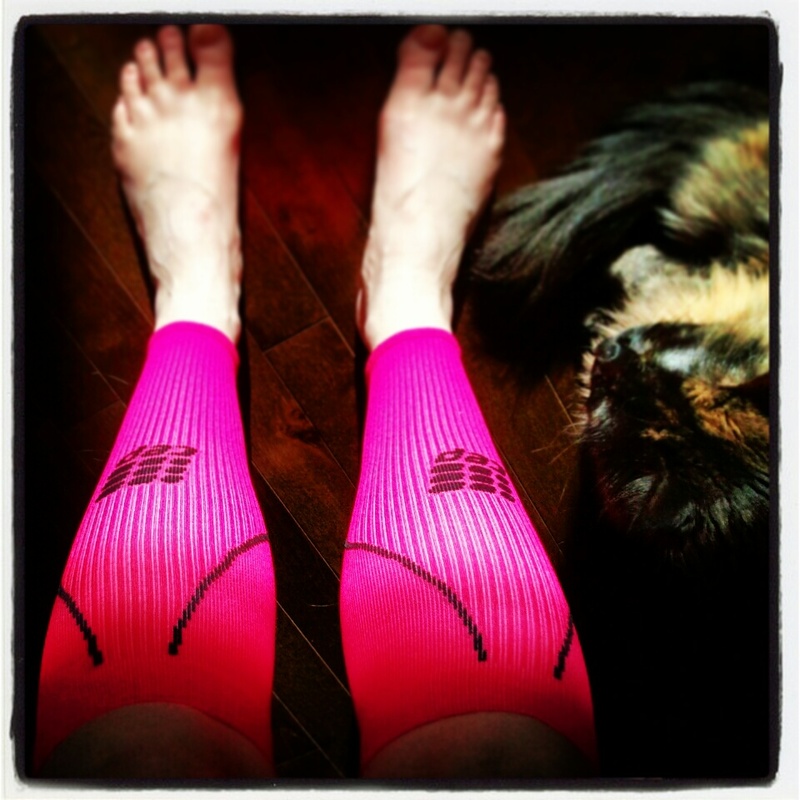 After trekking around Calgary on Saturday I located the very last pair of compression sleeves in Running Room Eau Claire. (Hot pink would not have been my first choice though they will go with my Adizeros). The research around their healing effects seems mixed, but I can tell you my calves are very pleased with them. The extra support takes away the feeling I might cramp at any minute. I'm going to try them out in both races. Now if I can just remember the important thing I have forgotten to pack.